Doctor’s Choice™ 50+ Men / 120 tabs - Nature's Way®. 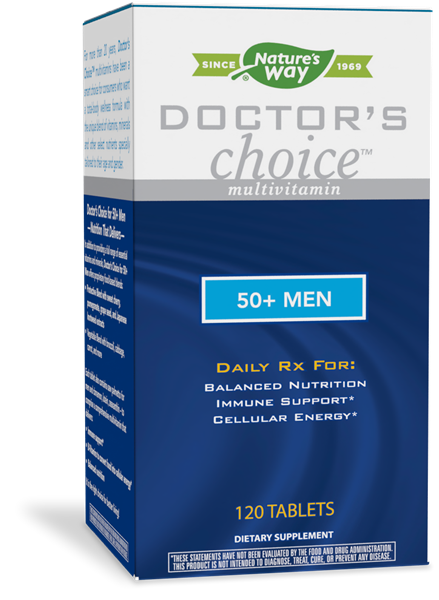 Why take Doctor's Choice™ 50+ Men? Doctor's Choice™ 50+ Men provides a full range of essential vitamins and minerals and offers targeted beneficial blends. Take 4 tablets daily with water. May take 2 tablets twice daily. Best if taken with food. How much caffeine does Doctor's Choice 50+ Men contain? Doctor's Choice 50+ Men contains a minute amount of caffeine, derived from the green tea leaf extract. The total daily amount of caffeine is only 1 milligram. For comparison, the average amount of caffeine in one cup of coffee ranges between 80 to 115 milligrams, depending on the method of brewing and type of coffee bean used.